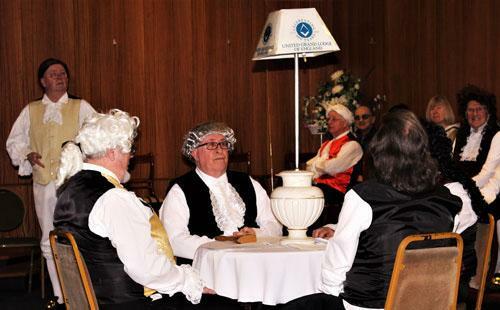 As part of the tercentenary or 300th anniversary celebrations for the establishment of Freemasonry, an interesting and informative ‘Historic Pageant’ was presented at Urmston Masonic Hall. Hosted by the Royal Protector Lodge No 3471, who graciously gave over part of their lodge meeting to the pageant presented by St Helens and Prescot Masonic Group. Pictured left: The operative Mason – ‘John Stones’. Pictured right: The herald. 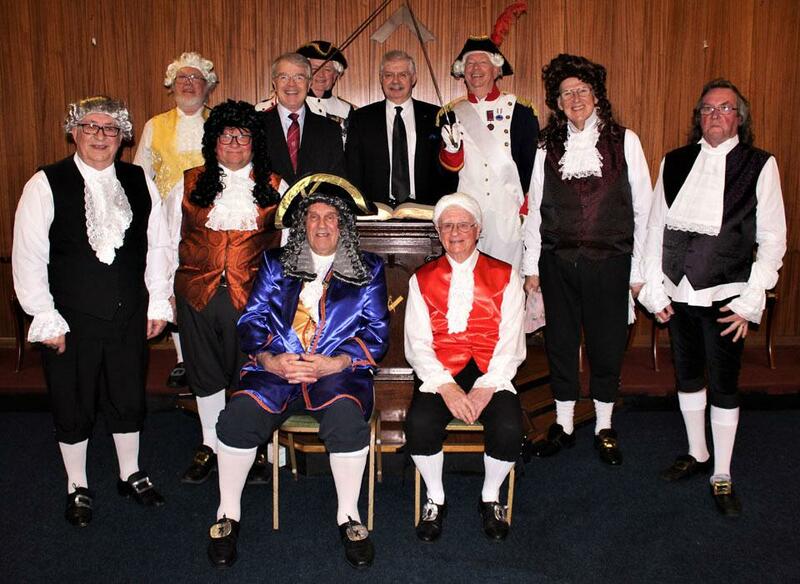 The group presented, complete with period costume, a concise timeline of the main historical milestones along the road to the formation of the United Grand Lodge of England representing the key figures in English (and Irish) Freemasonry such as Elias Ashmole from 1646 the first recorded ‘speculative Freemason’ and from 1717 Anthony Sayer, first WM of the United Grand Lodge of England. For those present who were not masons, the difference between ‘operative’ and ‘speculative’ Masons was demonstrated in the guise of the humorous, somewhat larger than life, fictional character John Stone who, throughout the proceedings, was seen chiselling furiously at a block of stone. 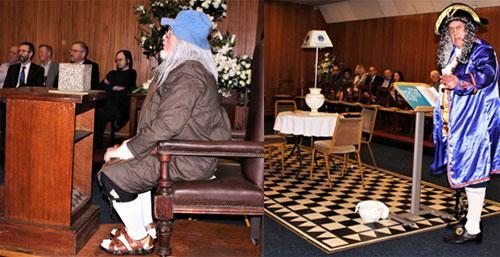 A typical (early) Grand Lodge Meeting. A representation of a Grand Lodge meeting was played out in the centre of the hall in which some of the major topics of the times were discussed and tying things together neatly and often comically, throughout the demonstration was another fictitious character that of ‘the herald’ who tenaciously recited the dates of the milestones one after another. Although it must be said, not without the ‘help’ of various characterised giants along the way such as Laurence Dermott the Irish ‘moderniser’ whose withering opinion of the pompous members of the English Grand Lodge could not be disguised and also Dr James Anderson who drafted the first Masonic Constitution in 1723 although not without difficulties. The pageant was rounded off with a theatrical bow from the whole cast and enthusiastic applause from the large, appreciative audience crowded into the Masonic temple in the venue and a convivial and jovial hotpot supper was enjoyed by all and a very successful, entertaining and informative evening drew to a close. The cast together with group chairman David Durling (centre left) and WM of Royal Protector Lodge Mike Walker (centre right).